Begin your tour over Toronto at the downtown city airport, where you'll check in, meet your pilot and board your 3-passenger helicopter. When everyone is buckled in, take off into the sky, rising approximately 2,000 feet (600 meters) in the air. Soar high above Canada's largest city, enjoying the aerial views of downtown skyscrapers, CN Tower, the picturesque Lake Ontario waterfront, the Canadian National Exhibition grounds, Don River Valley, Fort York, City Hall, the Royal Ontario Museum, Air Canada Centre, Rogers Centre (the former SkyDome), Ripley's Aquarium, St Lawrence Market and the historic Distillery District. 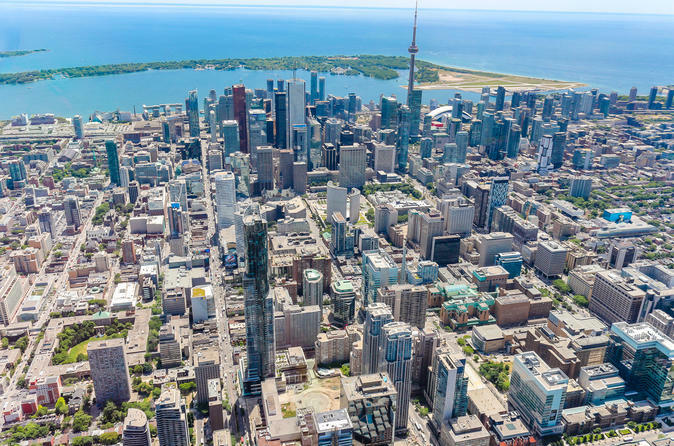 Fly southwest of the city center to see Humber Bay and High Park, and journey north to see Evergreen Brick Works, a former brick quarry, and Casa Loma, Toronto's famous Gothic Revival–style mansion. After 14 minutes of smooth flying, touch back down at the airport.